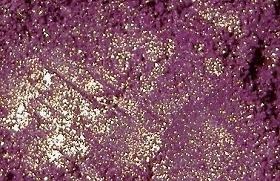 Vibrant pink-purple with gold shimmer and sparkle highlight. Like all semi-matte base shadows, we do not recommend this for use over Pixie Epoxy, but it may work well on an individual basis. Swatch applied over a thin layer of regular primer.